Described as “a savage beauty” by wordsmith Oscar Wilde, Connemara can make your heart sing and the rest of the world melt away. It’s rural Ireland at its most dramatic, so absorb it all with a walk into nature. 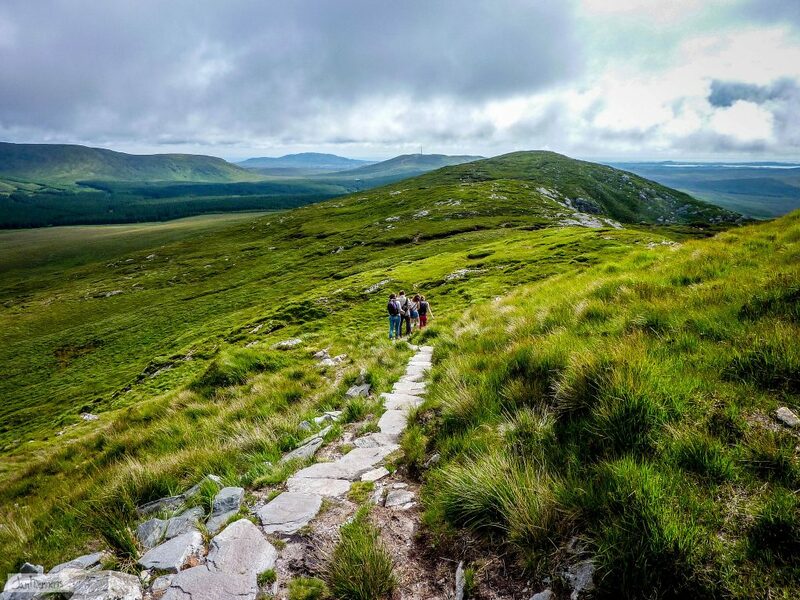 Connemara’s National Park summarises all that makes this region so special, and a great starting point for exploration has to be the Diamond Hill Loop Walk. With the Atlantic on one side and the famous peaks of the Twelve Ben Mountains on the other, be prepared to stand in awe. But that’s what Connemara – and Ireland – is all about: letting go of the mundane and filling your heart with something really quite special. We left the beautiful Boyne Valley and our group travelled westward towards County Galway, chasing the afternoon sun as we drove across Ireland. That evening, we had reached our next location – Connemara – a region famous for its wilderness and unspoiled scenery, and we were not left disappointed. After checking in to our accommodation in the heart of Connemara, we tucked into a hearty and delicious evening dinner. We sampled some fantastic local produce (don’t miss the wild Atlantic salmon or the black pudding) before we headed off again for some fresh evening air on a gentle walk around the amazing Diamond Hill. To set the scene, after driving the narrow country roads along the picturesque Killary Fjord, which is one of only three fjords in Ireland (the others being Carlingford Lough and Lough Swilly) we eventually arrived at Connemara National Park. Our starting point was the visitor’s centre. From here, the fully signposted and surfaced track guided us along the Sruffaunboy Nature Trail before we branched off towards the cone of Diamond Hill. This walk is suitable for all ages and fitness levels, so there is no need to be apprehensive or nervous. Gravel footpaths and wooden boardwalks ease your passage over the sprawling bog as you approach the foot of the mountain. From this vantage point, you can look west to the wild Atlantic and to the magnificent islands of Inishturk, Inishbofin and Inishshark; to Tully Mountain rising over Ballynakill Harbour and along the intricately jagged Connemara coastline. It is truly glorious. As you look east, the Twelve Bens mountains are nothing short of sensational and directly north, the summit of Mweelrea (the highest mountain in the province of Connaught and the 16th highest in Ireland) can be observed. 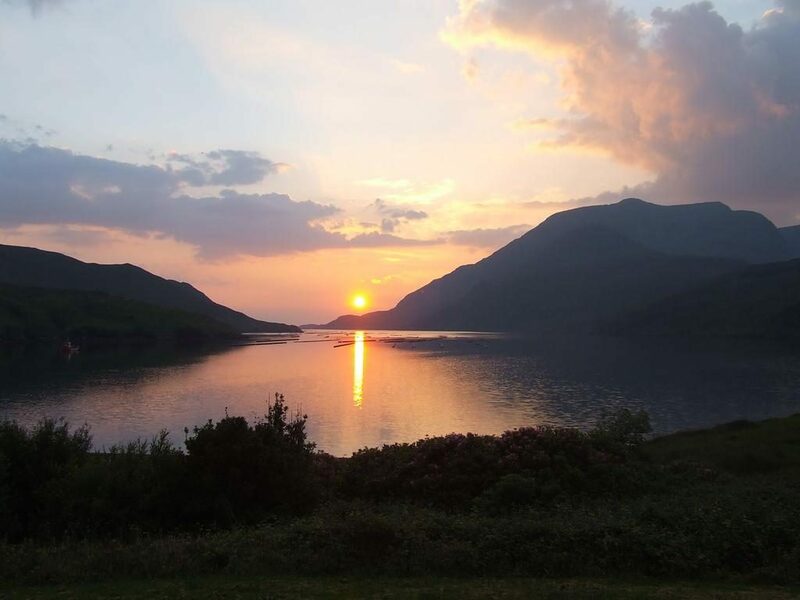 There are plenty of photo opportunities on this route with the Atlantic Ocean, mountains, Corrib Lake, Killary Fjord, some haunting fairy trees and the vast bogland of Connemara on our doorstep. Let’s just say don’t forget your camera. We turned towards home and back to our accommodation through the Connemara Valleys. The walk and the fresh Connemara air left us thirsty, so we were dropped to a remote, local Irish bar to enjoy a creamy pint of the black stuff. A few locals were playing traditional music as darkness fell outside. This easy going, a moderate walk is part of our Multi-Day Tours which range from 8 to 13 days. For a shorter trip, try our 3-day West Coast Explorer Tour. Follow the links to find out more and book your spot today.